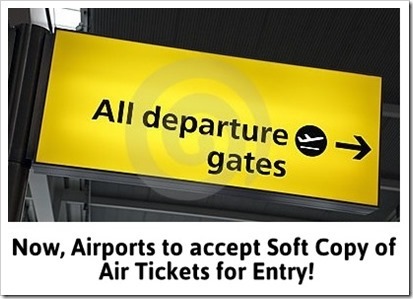 Enter Airports with only Soft Copy of Air Tickets! 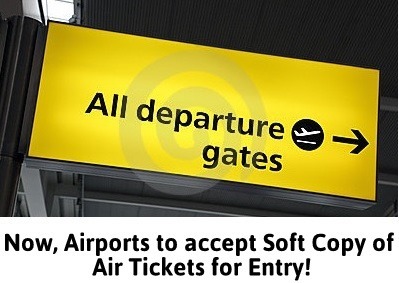 Now, Enter Airports with only Soft Copy of Air Tickets! Bureau of Civil Aviation Security (BCAS) has today come out with a circular that will put a smile on the faces of air travelers in India. They have announced that passengers will be allowed a soft copy or image of e-tickets as valid way to make entry at the Airports. Till date, a passenger was needed to carry a hard copy of their e-ticket for making entry into the Airport through Departure gates. However, passengers have to make sure that the image produced on mobile, tablet or laptops should be exact copy of the e-ticket that has been issued by the Aircraft Operators. Partial or unclear image will not be valid. SMS will also not be taken into account for entry of the passenger in the terminal. Along with the exact copy of e-ticket, the passenger will also have to carry a valid Identification proof to ensure the genuineness of the individual. BCAS has done a great thing by introducing this facility, which has been aggressively adopted by Indian Railways as well. It is not only very convenient for passengers, but also environmentally very friendly. I am sure many trees will be saved due this move from BCAS. With this move, Passengers do not need to carry any paper printouts, as they can furnish their PNR number from the soft-copy of e-ticket, which should enough them to procure the boarding pass for onward travel. Kudos to BCAS from taking this step! I just hope that all Airport guards have been sensitized about this move, because it is very much a possibility that next time I go to Airport without a hard-copy of ticket, and guards are unaware of this move by BCAS! Great move.. albeit too late! Imagine the savings in useless paper waste! The Indian aviation ministry follows suit after the Indian railways ministry. Good show.